Today’s most successful companies and Organizations do one thing very well. They Communicate. Whether it’s people connecting with people, people connecting with machines or machines connecting with other machines, every process is seamless, which makes operations efficient, productive and safe. Effective communications are an essential building block for success. But how do you know whether your communications platform is optimized for your business? And if there’s room for improvement, what steps can you take to get things working more smoothly? The challenges facing a multi-site manufacturing facility are very different from those of a transport company, hospital or school. Although their communication platforms are all underpinned by efficiency, productivity and safety, each will require its own individual solution. Even within a particular business, different individuals and teams will also require different solutions based on their specific roles and needs. One size does not fit all. In the previous section, we discussed how communications helps businesses achieve objectives. In the chapters to come we look at specific solutions and the steps you can take to build the right platform for your needs. This chapter focuses specifically on two-way radios and how to decide which devices will work best for you. The starting point is to define your needs by evaluating your business. Whatever the business, whoever the user, our extensive range of radios and accessories helps your people tackle challenges head-on. With the right devices in the right hands, everyone can respond and react quickly to every eventuality. But how can those devices be made even more effective, so every task is more productive and safer? In this section, we look at integrating data applications into your digital radios to extend their functionality beyond just voice. We identify the benefits of having real-time information at your fingertips and pose the question: is this something you need? Or more specifically, would your people work more effectively if they could receive instant project updates on their devices, access special skills and knowledge at the touch of a button and message colleagues in seconds? Whether you’re running a factory, transport company, hotel, hospital or school, we help you work more efficiently, productively and safely. Our extensive range of Motorola Solutions’ radio devices, applications and accessories provide quality solutions to empower your workforce and unleash the full extent of your business potential. Discover below how a few commercial organizations have built a brighter future through communication, information and collaboration. Need clarification on some of our features and technology? We’ve put together a short glossary of key terms to help you decide which devices best meets your needs. Founded as St. Louis Electronics Service Corporation in 1962, the company originally did business as St. Louis Electronics. Later as the company grew in the area it served, a new name, WirelessUSA was adopted. 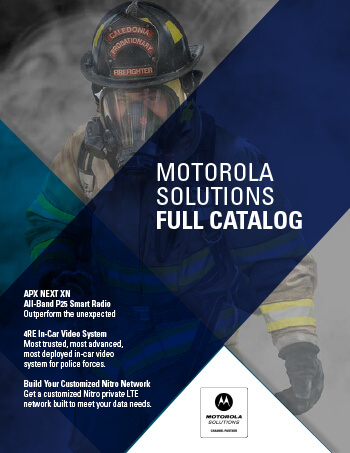 WirelessUSA has been supporting Motorola two-way radio products and infrastructure for more than 50 years. Why would you select the highest quality communications equipment available today and then jeopardize your investment by purchasing from a dealer who is not authorized by the manufacturer of the equipment they sell? WirelessUSA® has successfully implemented radio communications systems for clients that include the Missouri State Highway Patrol, the St. Louis Police Department, the Illinois Department of Transportation, the St. Louis County Police Department, the Federal Bureau of Investigation, Anheuser-Busch Companies, the US Drug Enforcement Agency, Scott Air Force Base, The Boeing Company, and many more. New Slim, Lightweight Two-Way Radio The SL300 is ultra-portable with a stubby antenna, curved edges and rugged frame and an Active View display. Approved Certified Service Centers clearly carry the mark of excellence by voluntarily matching their company against the strict national standards that have successfully served to identify quality service companies for over thirteen years.